We don’t know what will happen tomorrow. Miami’s vice called Dallas may win. Or the heat inside the American Airlines Arena may burn the Mavs. This is the beauty of sport. The surprise. The suspense. The thrill. There are no guarantees. Sure, odds and probabilities are plenty. 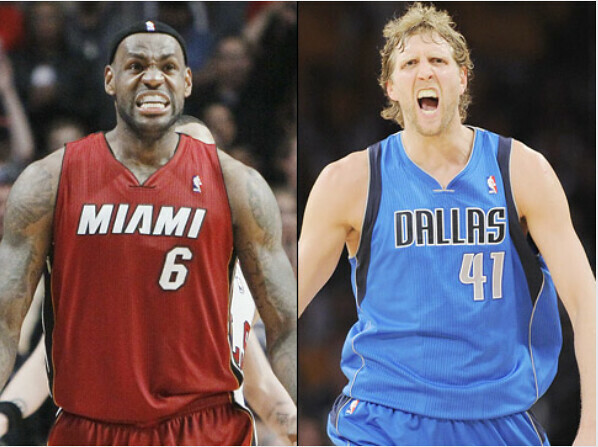 Experts predicted that the Miami Heat would go all the way — but lose to Dirk Nowitzki? The Spalding ball is round. It spins. It back-bounces. It rolls. This NBA Final is a dice roll. Pick the Texans to beat the Floridians? Good choice. Or, maybe not. Remember how Kobe Bryant, last year, flew from Boston to L.A. and won the season’s final two games? James can do a Bryant. Nike star can follow Nike star. We don’t know what will happen tomorrow. But this we know: In a battle of giants, the 7-footer is taller than the 6-foot-8. Dirk Nowitzki soars above LeBron James. All this, Dirk is doing despite a myriad of problems: an injured middle finger on his left hand during Game 1 and a 39-degree Celsius high fever in Game 4. While LeBron and Wade were supposed to be the clutch performers (think of their demolition of the Chicago Bulls), they’re lousy compared to the rule of one. . . Dirkules. Dirk has scored a combined 52 points in the fourth quarter. LeBron? Embarrassing. After zero points in the final quarter in Game 4, he scored only two meaningless points in Game 5. Total for LBJ in five games: 11 points. In Game 5’s last six minutes, LeBron missed two of three shots, had zero assists, zero rebounds, and one turnover. The Bavarian Bomber blitzes. Big D bombards. The King is dead. DALLAS WINS!!! Well…. Not so fast. Although the Game 5 winner has gone on to claim the trophy in 19 out of the 26 times after a 2-all score, “Miami 2011” hopes to do a come-from-behind like “Los Angeles 2010.” Possible? Yes. In Hollywood, anything is possible. In Miami? Only if LeBron James rises to the challenge — and up on the air — like Michael Jordan. It all culminates in tomorrow’s Game Six. Whoever wins the 8 to 10:30 A.M. contest wins the ring. 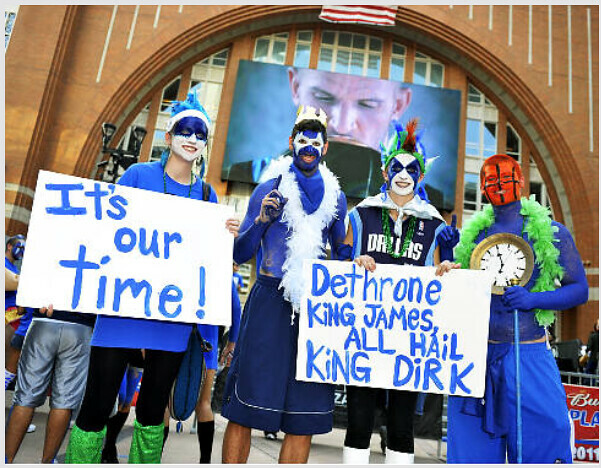 If Miami stops the Dallas momentum, the balance of confidence will shift. The NBA Finals is like a seesaw. 1-0. 1-1. 2-1. 2-2. 3-2. Not a seesaw anymore. Dallas takes it 4-2. Miami, though, looks like it can take a few championships in the next few years. They are loaded. But Lebron has to get over whatever ails him in the big moments. Not a good series from him to go with the dissapointments of the previous final series from him. He just seems to go hiding in big moments in big games more often than not.